Blog post: "NSTA's E-mail List Server: A Gold Mine of Help at Your Fingertips"
Welcome to the NSTA list server. NSTA’s lists are group email discussions that allow members to exchange information in a peer-to-peer forum. NSTA Members who subscribe (at no extra cost!) can now select from 22 topic areas: aerospace, biology, chapters and associated groups (CAGs), chemistry, computer science, early childhood, Earth science, education policy, elementary, engineering, environmental science, general science, high school, middle school, new teacher, Next Generation Science Standards (NGSS), pedagogy, physical science, physics, retired teacher, STEM, and technology education. The lists remove geographical boundaries from member communication and are available to you—right now—wherever you are. Colleagues on the list server can share ideas, get information, and ask questions on important issues. The list server is quick and simple to use, so you can easily stay current on trends in science education. The lists are available 24 hours a day, seven days a week, so information from your peers is available when you need it. 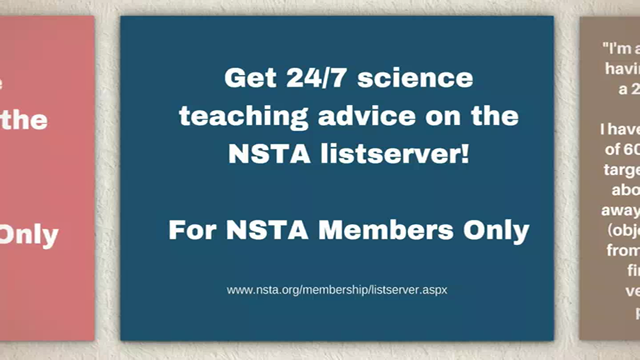 Sign up for NSTA's networking list server—automated email discussion groups for interactive discussions with your peers. The NSTA email lists are designed to improve communication among like-minded members, offer a forum for exchanging ideas and thoughts, and provide answers to questions and challenges faced by fellow members. NSTA members with email and web access can participate in the email lists. You can join a list, change your email address, and unsubscribe from a list on the web. Here's how. You will need your member ID to subscribe. If you have forgotten it, click here to reset it. Browse to the list management page. Click on the box(es) corresponding to the list(s) you would like to subscribe to; uncheck any you wish to unsubscribe from. Browse to the member profile page. If you are not logged in, log in using your last name and member ID. Sending a message to the list server is very easy. It involves nothing more than creating and sending a normal email message to the address of the list you'd like to start a conversation on (see list server email addresses above). To reply to messages you receive from the list server, be sure that the send-to address appears as <listname>@list.nsta.org, where <listname> is the name of the list (e.g., physics@list.nsta.org). Avoid resending the entire message to which you are replying by cutting and pasting the relevant parts into your response. Using the reply button in your email application will automatically send your response to the entire list. To reply directly to a member of the list, forward the email and copy and paste his or her email address into the “To” line. Identify yourself with a signature tag in all messages. Include your name, title, location, and email address. Please take a moment to acquaint yourself with these important guidelines. If you have questions, contact the list administrator. NSTA reserves the right to suspend or terminate membership on all lists for members who violate these rules. By joining and using NSTA's email lists, you agree that you have read and will follow the rules and guidelines set for these peer discussion groups. You also agree to reserve list discussions for topics best suited to the medium. As with any community, there are guidelines governing behavior on the list servers. For instance, violating antitrust regulations, libeling others, selling, and marketing are not permissible. Do not challenge or attack others. The discussions on the lists are meant to stimulate conversation not to create contention. Let others have their say, just as you may. Do not forward, copy, or paste all or portions of emails sent off-list to you or from you to any NSTA list email address. Do not post commercial messages. The cyberspace term for this is spamming. When recommending a commercial product or service in response to a request for suggestions from another listserv poster, please share your personal experience with that product or service. Unsolicited recommendations of a product or service from a for-profit entity will be viewed as a commercial message. Please do not contact people directly with products and services that you believe would help them. Please try not to include attachments. Attachments of any malware will result in immediate suspension of your list subscription privileges until such time as credible proof of the complete repair and "disinfection" of your system can be provided to NSTA. If you wish to share large or multiple files, please click to NSTA's Community Forums, where you can upload and download resources of any file type in groups similar in taxonomy to the listservs. All defamatory, abusive, profane, threatening, offensive, or illegal materials are strictly prohibited. Do not post anything in a list server message that you would not want the world to see or that you would not want anyone to know came from you. Remember that NSTA and other email list participants have the right to reproduce postings to this list server. Any message sent via the lists should not be considered private. For your own security, please do not include any confidential information. The NSTA Email Lists are limited to use by NSTA members. Please do not post messages on behalf of a friend, student, or colleague. Do not send the same message to multiple NSTA lists. You may send your message to only the most appropriate list. Cross-posting of messages is not allowed. Harvesting contact information of participants in list server discussions is not allowed. Self-promotion for commercial gain is not permitted. If you share a survey request, you must state the purpose of the study and who is sponsoring it, show your methods, and offer to share the results. This list is provided as a service of the National Science Teachers Association. NSTA accepts no responsibility for the opinions and information posted on this site by others. NSTA disclaims all warranties with regard to information posted on this site, whether posted by NSTA or any third party; this disclaimer includes all implied warranties of merchantability and fitness. In no event shall NSTA be liable for any special, indirect, or consequential damages or any damages whatsoever resulting from loss of use, data, or profits, arising out of or in connection with the use or performance of any information posted on this site. Do not post any defamatory, abusive, profane, threatening, offensive, or illegal materials. Do not post any information or other material protected by copyright without the permission of the copyright owner. By posting material, the posting party warrants and represents that he or she owns the copyright with respect to such material or has received permission from the copyright owner. In addition, the posting party grants NSTA and users of this list the nonexclusive right and license to display, copy, publish, distribute, transmit, print, and use such information or other material. NSTA routinely monitors posts to all of the lists for inappropriate postings or violations of the legal rules (above) and the list server etiquette (below), and will notify those in violation privately, off-list. Depending on the severity of the violation, NSTA will take all appropriate action, including suspension or termination of access to the lists. NSTA reserves the right to terminate access to any user who does not abide by these guidelines. Include a signature tag on all messages. Include your name, affiliation, location, and email address. State concisely and clearly the specific topic of the comments in the subject line. Include only the relevant portions of the original message in your reply, delete any header information, and put your response before the original posting. Send messages such as “thanks for the information” or “me, too” to individuals—not to the entire list. Do this by using your email application's forwarding option and typing in or cutting and pasting in the email address of the individual to whom you want to respond. Do not send administrative messages, such as remove me from the list, through the list server. Instead, use the web interface to change your settings or to remove yourself from a list. If you are changing email addresses, you do not need to remove yourself from the list and rejoin under your new email address. Simply change your settings.